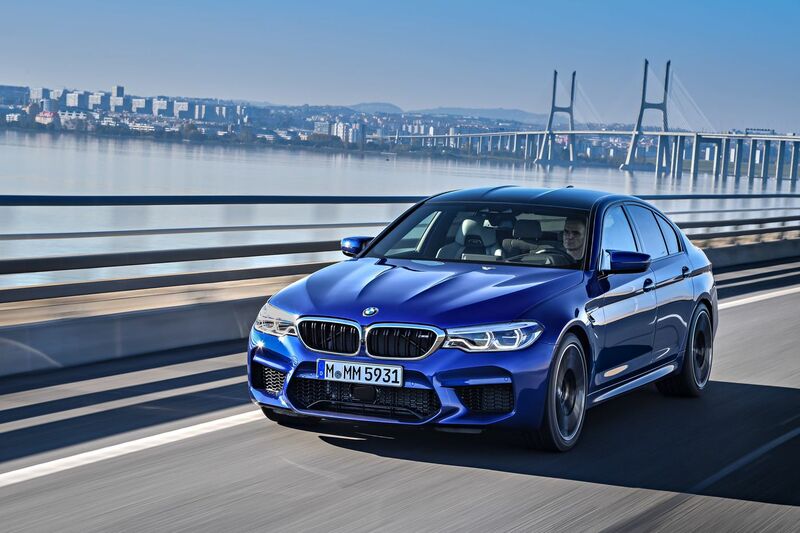 The 2019 BMW M5 is a low, athletic-looking sedan, that really kicks on the road or racetrack. Price: $129,795. The M5 starts at $102,600. Add $3,000 for the M Driver’s Package, $1,700 for Driving Assistance Plus, and $1,300 for 20-inch tires. Many, many more options outlined throughout. And back down again: The M Ceramic Brakes cost $8,500 and take some getting used to if you don’t want to get rear-ended — or have passengers tossing their breakfast. But face it, if you’re buying a $129,000 BMW, you probably have no friends. On the road: So here’s where I come off as Mr. Goldilocks Seat — this car is too soft; this car is too hard. Last time around I whined that the M5 was far too smooth until drivers start breaking speed limits. This time, the M5 is really tight and athletic — almost too much so. Everyday driving can require a whole lot of concentration. High tech: The special features designed to keep drivers from running into stuff or off the road take a lot away from the driving experience, as well. The lane-keeping picks up road seams and puddles; when I turned it off and started to complain, the Lovely Mrs. Passenger Seat bravely volunteered that she wondered whether something was wrong with my driving all of a sudden. And one other complaint — the light on the dashboard for these features actually matches the steering wheel icon for self-driving mode. The car with the circle around it turns off the offending features. Shifty: The fun BMW automatic shifter takes some practice, but it does what it intends to well. Shift mode for the eight gears works delightfully from the lever or paddles. The gears engage at varying levels of harshness depending on whether comfort or sport mode is selected. The 2019 M5 looks like a BMW inside, but with some extremely nice touches. Driver’s Seat: Ooooo. The accommodations are nice. Drivers sit low to the ground, and the aragon brown full merino leather seats offer great comfort and support, but they should for $3,500. Supple and smooth. And for this price level, BMW finally offers cooled seats as well as heated (as part of the $4,000 Executive Package, which also added soft-close automatic doors, parking assistant plus, and more). Friends and stuff: Rear-seat passengers will enjoy heated seats, as well, but Sturgis Kid 4.0 reports that accommodations are on the tight side. Cargo capacity is 18.7 cubic feet, quite spacious for the category. Keeping warm and cool: I’ve made a similar snide remark before, but it only takes $129,000 to get a BMW with ventilated seats. The controls for fan, and heating and cooling the seats are a new breed of soft touch. They work admirably but are so fussily small that I can’t decide whether I like them or not. Play some tunes: The Bowers & Wilkins sound system ($3,400) offers excellent sound quality. All manner of adjustments are available to make the songs exactly how you like them. BMW’s classic console dial makes it fairly easy to get from spot to spot. A separate tuning dial would make the whole package far more complete. Fuel economy: For all the racing, I averaged about 22 mpg in the usual Mr. Driver’s Seat’s commuting patterns, but with far reduced commute times. Where it’s built: Dingolfing, Germany. How it’s built: Consumer Reports isn’t buying this, so you’re on your own. In the end: As joyful as the Challenger is, the M5 really is all that. Save a little bit at the end of each week and by the time you’re too old to drive, you’ll be able to buy one.